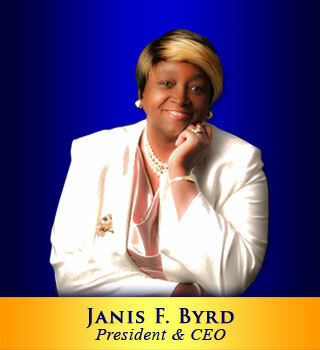 Pastor Janis F. Byrd was born in Buffalo, New York and is the youngest of 5 children. She began her education in the Chicago School System where she completed high school. Pastor Byrd gave her life to Christ in 1990 and was later filled with the Holy Ghost. She is currently under the anointed leadership of Bishop Iona E. Locke of Christ Centered Ministries Assembly. She previously served and was trained under the anointed leadership of Pastor Estelle Dixon founder of Restoration Holiness Church. She has served as armor bearer to Apostle DeLoris Moore founder of A Taste of Jesus Ministries, and she previously attended Roberts Temple COGIC under the leadership of Eld. Cleven Wardlow, Jr. She also attended Chicagoland Christian Center Bible Institute in Chicago, IL. Pastor Byrd was commissioned in 1996 by God to form Jesus Is Alive Ministries where she currently serves as CEO. Out of this ministry she was called by God to pastor "I AM'S" Holiness Church which was birthed in 2001. Her calling scripture is: Is. 58:1 "Cry aloud, spare not, lift up thy voice like a trumpet, and shew my people their transgressions, and the house of Jacob their sins." She was ordained as pastor of "I AM'S" Holiness Church (a Bible believing, Bible teaching Church) on January 14, 2001. Pastor Byrd's ministry is strongly dedicated to loving all people, obeying God's Word, reaching out to lost souls, ministering to hurting people, and inspiring the believer. She endeavors to minister to the total man through social and spiritual services whereby the gospel and faith are applied in daily life. She also serves as a spiritual advisor to Compassion in Action Ministries and Zion Call Ministries located in Chicago, IL. She is an anointed writer. Inspired by the Holy Spirit she has written several Christian plays that have been performed at various churches throughout the Chicago land area and also in McKeesport, PA.
God has given Pastor Byrd many gifts that are used to edify the body of Christ and to draw the unsaved to salvation. Pastor Byrd is also anointed to operate in the gift of humor. Proverbs 17:22 (NIV) states "A cheerful heart is good medicine." Many yokes have been destroyed through her anointed gift of laughter and her cheerful heart. She is an anointed shepherd after God's own heart, walking in a spirit of integrity, excellence, truth and love. She is totally committed to building the Kingdom of God therefore; God has raised her up for such a time as this. She will go above and beyond the call of duty because of her love for God's people. Pastor Byrd has a loving husband, Deacon Robert Byrd and a loving daughter Elder Latrice Saxon and many spiritual sons and daughters.